When October arrived, instead of heading to Park City like the team has the past 5 years, we travelled to Mammoth Lakes, California for our fall National team altitude camp. Exploring new training locations around Mammoth Lakes. It is always exciting to have a camp in a new location. The workouts passed quickly as we explored new roads and trails. The camped spanned two weeks and had a volume focus with back-to-back time trials at the end of the camp. We were staying up at the top of Mammoth Mountain at 2700m and trained between Bishop at 1300m, and the surrounding mountain peaks as high as 3500m. This is the highest I’ve ever slept, so I started off the camp a bit conservative to adjust and built up to longer days as the camp progressed. The Mammoth Lakes area provided an amazing variety of roads both flat and hilly to create the perfect training environment for our altitude camp. View from the natural hot springs. One of my favourite workouts was an over distance day roller skiing up Rock Creek Road and finishing with a run up to Ruby lake where I jumped in for a glacial dip. Trying to warm up after jumping in a glacial lake in October and immediately proceeding to scramble back up on this rock. Between the distance workouts we also had a couple of fun sprint sessions and some good building z3/4 intervals before ending the camp with a double time trial. On time trial day, the morning started with a skate sprint qualifier followed by a 3.5km uphill skate time trial. Really hard efforts after a long volume camp, I was happy to feel strong in both time trials. Pushing myself in a time trial effort against my teammates got me really excited for the race season. After our time trials we had one more day of camp and we were rewarded for our hard efforts with a beautiful hike above silver lake before flying home. Hiking adventures above Silver lake. Felt a bit like a James Bond movie. Our return from California was timed perfectly with the opening of 2 kilometers of skiing on Frozen Thunder. If was awesome to be skiing again. I was pretty tired after the camped so a few easier days were in order. The post camp rest week passed quickly and then it was already time for the Frozen Thunder races. Still feeling tired from the camp I was hoping my body would snap into motion after a hard warm up, and luckily it did. Beautiful sunrise on Frozen Thunder race morning. The sprint was once again the king’s court format again this year, mixing men and women together with people who qualified with similar times. I had a ton of fun chasing some teenage boys around the 1.5km sprint course for two rounds, trying to keep up and pushing my limits. The final round went back to a women’s final and it was fun to see some younger faces up on the podium with me, including my former CCC women’s committee mentorship program mentee, Hannah Mehain. After four rounds of racing taking the start line for the distance race the next morning made for a hard race. It is amazing how sore the first classic sprint of the year makes you, every year. Day two was a 7.5km skate race. I was pleased to be able to push myself the entire way, although I was a bit stiff. 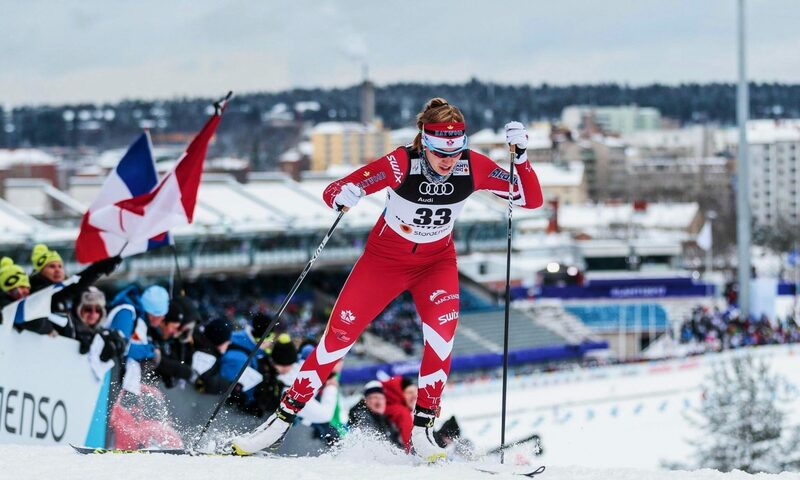 Overall I was happy with the race and the weekend and I am looking forward to putting on a bib again in a few weeks at the Alberta Cup in Canmore. Frozen Thunder race results on Zone 4. For the next week I can be found at Silverstar skiing with a giant smile on my face around the Sovereign lake trails. This morning’s ski was winter paradise at sovereign lake and I already can’t wait to get back out on the trails this afternoon. The entire Alberta World Cup Academy team will be here for the week to get in some good quality volume training before switching to race mode. The Academy Women’s team all smile during our first ski at Sovereign! This season will be starting my winter a bit differently than the past two seasons. I will be racing the December NorAm’s in Canada. Sovereign Lake Dec 9-10 and Whistler December 13-16th before heading over the Europe for the end of December to race on the World Cup, hopefully starting with the Tour de Ski on December 29th. If you would like to follow my season I will be adding a race calendar on my website this week with my race schedule and result links. Make sure to check back there for updates as the race season gets underway.